If you have decided to use video in your email marketing campaigns, good for you! As we explained in our last post, video is the next big thing in email marketing. There are several options for creating videos for email use. Which one you use will depend on your budget and your audience. A static callout linking the viewer to a web-hosted video. This method is the one most used by marketers. Embedded video embeds the video directly into the email. While the quality my be better, keep in mind that embedded videos might not work in all email clients. Gif videos is a way to ensure that your video will work with almost all email clients. While this format has its limits, when it is done well, it can enhance your email campaign without having to invest a lot in production. Once you decided on a format content needs to be developed. As with email text, you will want to ensure that your video content is relevant and compelling to the viewer. You might want to supplement your generic message with some form of personalization. For example, locr has a range of solutions that enable you to include an animated, personalized map as part of your video. “Zoom” the viewer into a specific location with our LOCALmaps. Animate the multiple stops and transportation a user could experience on a trip with our MULTImaps. Animate the driving route the viewer would take from one location to the next with our NAVImaps. 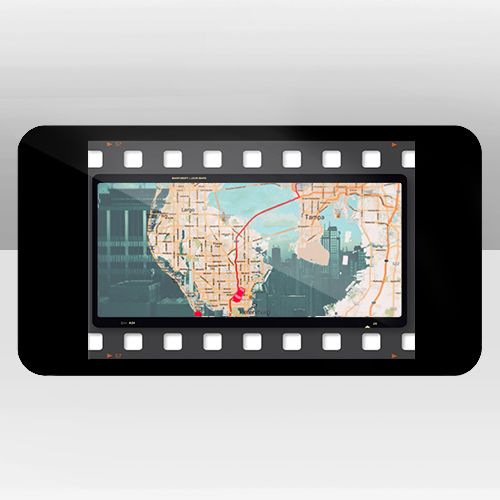 Personalized maps are easy to add to your video, and are a great way to engage your prospect to a one-to-one communication.